Preset options for IP Phone, IP Camera, Wireless devices, etc. VLAN provides a way for businesses to assign network functions to different workgroups, branches, sections, employees or visitors, according to their operational requirements. VigorSwitch G2260 offers the Layer 2 Isolation feature (tag-based) VLAN for the groups. You can also use network devices’ MAC addresses for the VLAN profiles (MAC-based VLAN). The Voice VLAN function of VigorSwitch G2260 assigns a preset VLAN profile with appropriate level of QoS for VoIP traffic. This ensures that voice related traffic will not be delayed because of inappropriate priority treatment. For each of the VLAN groups, you can set rate limits for both ingress and egress traffic based on per port or per group. With the increasing number of mobile devices joining PCs and servers in business environment, the configuration of network switches can be a source of frustration. 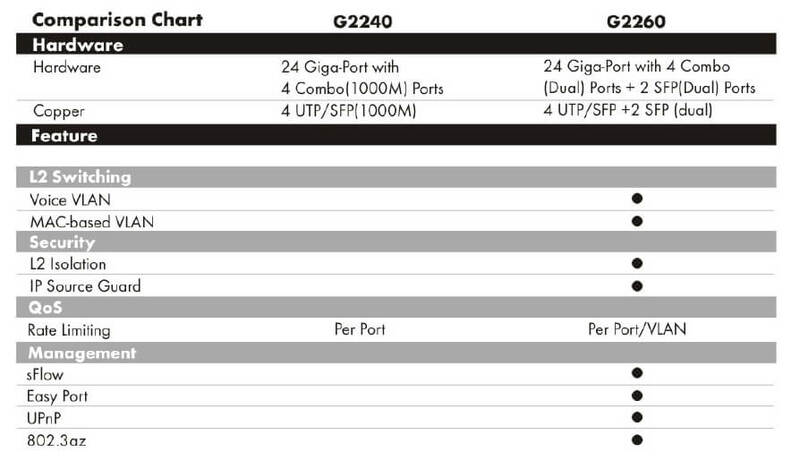 VigorSwitch G2260 comes with preset options for network devices such as IP phone, IP camera, Wireless devices, etc. The web based configuration pages allow you to just select the well sorted options, such as security and network features (ACL, IP Source Guard, VLAN, QoS, etc.) as required. VigorSwitch G2260 supports Universal Plug and Play (UPnP) features, making it easy to connect network devices including PC, server, IP phone, IP camera, Wireless AP, etc. And with the ample number of Gigabit Ethernet ports on the LAN side and the UTP/FTP ports on the backbone side, these features make building up of business network infrastructure a lot simpler. Following DrayTek’s green product policies, VigorSwitch G2260 complies with IEEE 802.3az Energy Efficient Ethernet standards. When it detects that the network is idle it will turn to Sleep mode. Also, it detects the cable length automatically and send the packets with just enough power for the devices. In this way, it saves power consumption costs, being environmentally friendly while maintaining high performance levels. Often the network administrators need to monitor data flow on each port for the purpose of accounting, billing for usage, security checking, performance optimization, etc. VigorSwitch G2260 supports sFlow sampling protocol, allowing monitoring of network traffic without interrupting data flow or compromising traffic performance. 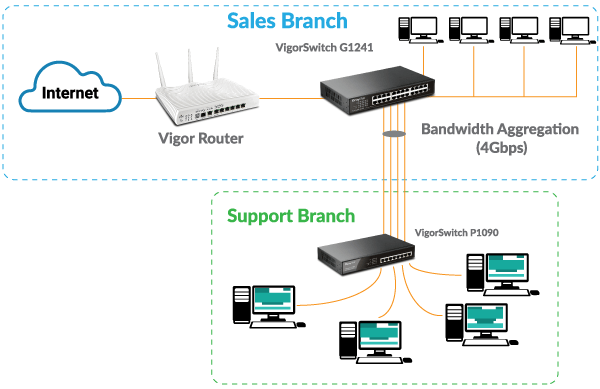 Central Switch Management is available through a supported Vigor router such as Vigor2860 series, Vigor2925 series, Vigor2952 and Vigor3220 series routers. It provides a convenient and easy way to manage and configure VigorSwitches. Instead of logging into each of these switches and work through the configuration pages, you can log into the router that has integrated configuration pages with all linked VigorSwitches. For instance you can create VLANs to provide a number of virtual networks within an organization, or to view status of attached switches from within the router console. This will simplify the configuration tasks and reduce troubleshooting efforts. 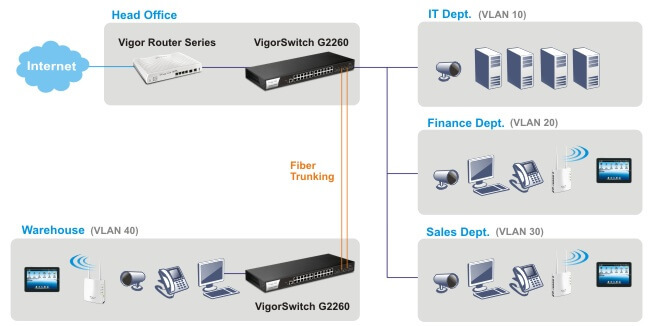 Many network functions rely on interworking between the router and the switches; therefore DrayTek has designed integrated configuration pages for Vigor2860 series, Vigor2925 series, Vigor2952 and Vigor3220 series to interwork with VigorSwitches. You will be able to manage and configure VigorSwitches from a TR-069 based centralized management system. Use VLANs to secure your network by creating logical workgroups. VLANs can span over multiple switches so workgroups can be located in different physical locations or floors within a building. 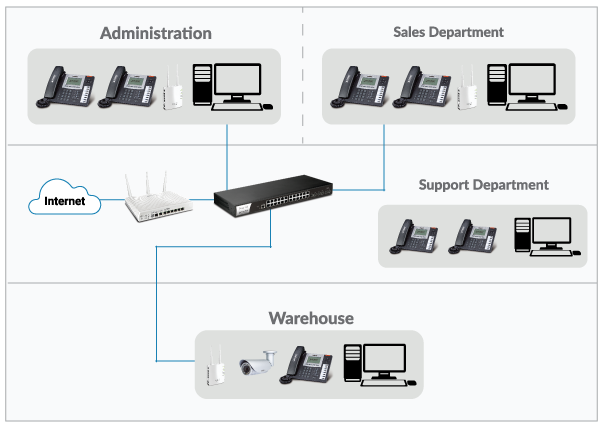 For example, a Sales Department may be located on the 1st floor of a building, but some of the sales people are located on the second floor and still be part of the sales VLAN. The IEEE 802.1q VLAN trunk feature means that only a single LAN cable connection is required between the router and the switch, and/or between the switches, is sufficient to create a number of VLANs for different departments. 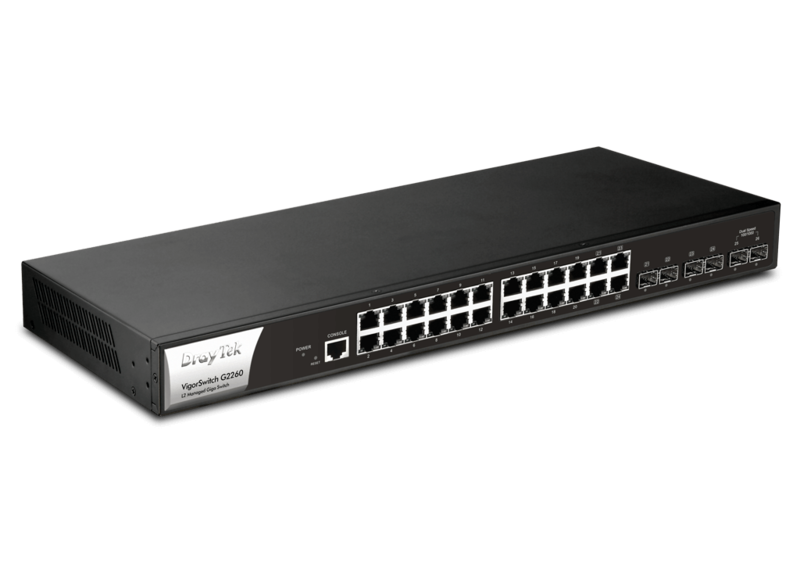 Increase bandwidth between VigorSwitches by aggregating multiple switch ports to form load-sharing trunk groups. The switches can be cascaded in Daisy Chain or Star topology to provide high speed data links. The connections can be with Ethernet cables or Fibre cables. 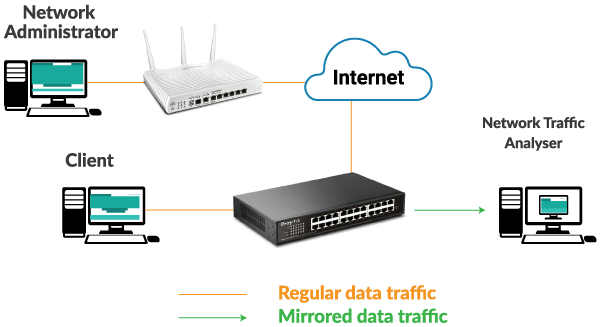 Network traffic can be monitored or analyzed by utilizing the Port Mirroring function in VigorSwitches. This is a handy diagnostic tool for forwarding ingress/egress traffic (RX/TX) to a switch monitor port for analysis by a network analyzer or anadministrator. 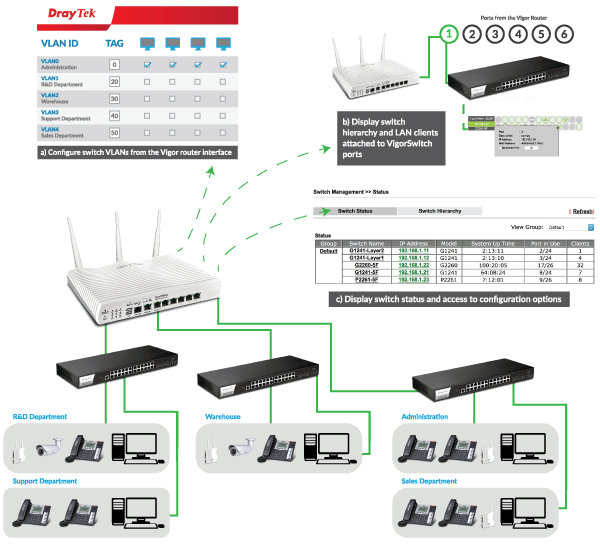 DrayTek VigorSwitches Quality of Service (QoS) feature provides eight queues to classify traffic types according to 802.1p VLAN priority tag, DiffServ and/or DSCP based. 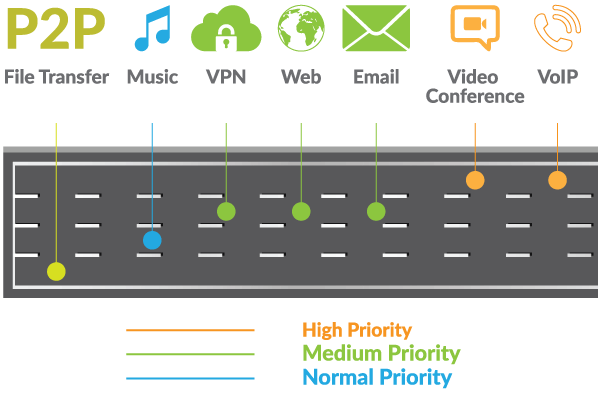 You can prioritize traffic type based on the traffic’s tolerance to network delays. Applications such as VoIP or Video Conferencing, both requiring real time data delivery, can be prioritized to ensure satisfactory operation.